Do you like to scrapbook? Make your own greeting cards? Decorate bulletin boards? If you said yes to any of the above, then you will love the Cricut Expression cutting machine! I have had my Provo Craft Cricut Expression machine for several years now… and I LOVE it! It has taken my paper crafting to a whole new level of professionalism and fun. Use the sticky cutting mat to adhere your selected paper. Choose your image on the keypad. See it on the display screen. Then, sit back and watch the Cricut machine automatically move the mat back and forth as it precisely cuts the image. The Original Cricut uses a 6″x12″ cutting mat. The Cricut Expression can use 12″x12″ or 12″x24″ cutting mats. You can use paper the same size as your mat or small scraps, depending on the size you want your image to be. The size is chosen using a dial on the side of the Cricut. The machine will tell you if you choose an image that is too large for your paper. Each Cricut cartridge includes a plastic overlay to place on the machine’s keypad, plus an instruction booklet. The plastic overlay will indicate key selections for that cartridge only. By using special keys called “creative features,” every regular key will cut multiple things. The booklet will show you exactly what the options are for each key. There are 2 types of cartridges: shape and font. Whew – that’s a lot, right?! Each Cricut cartridge has different “creative features,” which can allow literally hundreds of different cuts from just one cartridge. Since you can use paper of any size and color, the possibilities are endless! There are additional features on the Cricut Expression that provide even more options — such as quantity, flip, portrait, fit-to page, and more. See if the price includes any Cricut cartridges or tools. I have seen them advertised several ways (from nothing included to your choice of 2 or more cartridges). I got mine on eBay and it included 2 cartridges and 2 cutting mats. Cricut tools are usually sold separately. 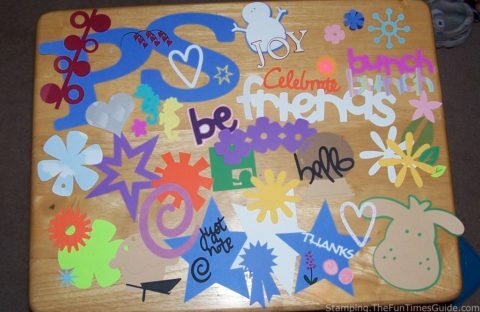 A Cricut cutting mat is required, because it has a thin layer of tacky adhesive which gently grips materials and holds them flat to prevent tearing or shifting during trimming. You will also need a Cricut spatula to help remove cuts from the mat. I tried using mine without a spatula, but couldn’t do it. I even tried using a real spatula from my kitchen (a tiny one, not much bigger than the Cricut spatula), but no luck. When you cut out a word (such as “HAPPY”) the word will be 5 individual letters, not one connected word. This can be a real challenge, especially with small letters. I have a pair of craft tweezers that I use for this, and I typically use a fat font (like Roly Poly) because it is easier to work with. Really small, thin fonts can be very difficult to pull off the sticky mat without tearing them (truly impossible without that Cricut spatula). Many cartridges have “phrases” as an option, which will be cut as one continuous shape. There is Cricut software available called Design Studio which is available. It allows you to “weld” letters and shapes together to form one word. The Cricut sticky mats don’t last forever. Fortunately, there are lots of tips and videos on how to make the mat “re-sticky” using products like Aleene’s Tack It Over & Over or repositionable adhesive sprays. I have successfully done that to one of mine. Be careful with a new or newly sticky mat and thin paper; it might tear as you pull it off. Even some cardstock will be tricky to remove from very sticky mats. Speaking of Cricut tips and hints, they are everywhere! So don’t worry if you get your new Cricut and can’t figure out how to do what you want. They have a great online community full of people who are willing to share their expertise and ideas. Plus, there are tons of “how-to” Cricut videos posted by users online. There are over 100 cartridges available for both Cricut machines! But you won’t need that many. I got by for about a year with just 2 cartridges — one with fonts and one with shapes. Now I have 8. There are still so many things I can cut with my 8 Cricut cartridges that I’ll never get to them all! If, like me, you’re always watching for bargains and you regularly shop at Hobby Lobby, Michael’s or JoAnn Fabrics, then you are probably already familiar with their weekly coupons. Unfortunately, they all state that the coupon cannot be used on any Cricut products. Those stores do occasionally have good sales on Cricut items though. Which Cricut Machine Is Best? If you’re considering a Cricut and think you want the original, smaller Cricut Personal Cutter, I would encourage you to reconsider and get the Cricut Expression instead! With the original Cricut, you will have to purchase the special 6″x12″ paper or always cut your own paper to that size. 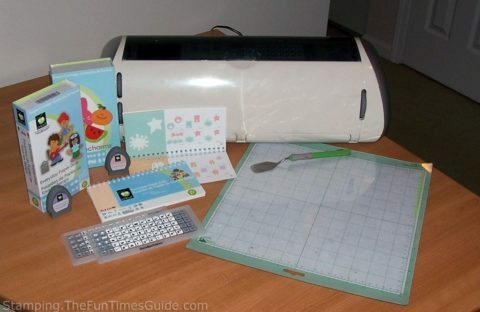 The Cricut Expression can use paper commonly used in scrapbooking: 8.5″x11″ or 12×12″. These next 2 videos might help you see some of the similarities and differences between the original Cricut Personal Cutter and the Cricut Expression machine. Cricut vs. Silhouette: Which One Is Better? Whether you’re a teacher, homeschooling mom, or just an avid crafter, the Cricut machine is a tool that you will use over and over again. Regardless of which Cricut you ultimately choose, you can bet that you’ll get years of enjoyment from it!